Kayaking can be dangerous, especially when journeying in the backwaters or on the ocean. It can be difficult to remember where you are and how to get back to your starting point. For this reason, having a kayaking GPS is a key to your safety. When shopping for a kayaking GPS you want to consider size, whether or not it is waterproof, battery life, and map features. 1.1.1 What About Using a Phone? When choosing a GPS, it is important to ensure it has all the features you need. Consider what you will use the GPS for. Will you solely use it for kayaking? Are you planning on using it in the car or for hikes as well? All of these decisions can have a great impact on which GPS you choose. It is important to make sure that your GPS has adequate battery life, is waterproof, is small enough to keep on your person, and has the map features you need. The most important feature of any kayaking GPS is that it be waterproof. Garmin’s Montana 650 does not disappoint. This company, famous for its GPSs, has designed a handheld GPS perfect for all outdoor activities. The Montana a four inch screen display which is viewable even on the sunniest of days. It also can take pictures with its 5 Megapixel camera. This camera automatically geotags your pictures for you, which is a handy feature for remembering where you were. Another beautiful feature on the Montana 650 is that you can easily share information with other Garmin users wirelessly. You can share your location, pictures, or trips with them, which can make kayaking trips even more fun. Another geo-feature is that the GPS supports geocaching. This can be a really fun way to use a GPS, especially when kayaking. To use this GPS, you may want to bring 3 AA batteries with you (or more, depending on the length of your trip). The rechargeable batteries on this GPS only last about 16 hours. So it is important to have a back up. Due to its small size, the Montana should be no issue to use and store on your kayak. Given that it is waterproof, you do not need to worry about keeping it in a waterproof compartment. It should be perfectly fine anywhere in your kayak, though you probably want to store it in a hatch or on your person in case you would tip over. Another great feature on this GPS is that it comes equipped with a compass and an altimeter. It will also tell you when the sun is going to set. This is handy for those who hope to be a little more rugged or just in case the GPS stops working. This GPS operates off of preloaded maps, so it is rare that you would be unable to access your maps. However, should you wander outside the region of your preloaded maps, you may need to use the compass to get back into your map area. 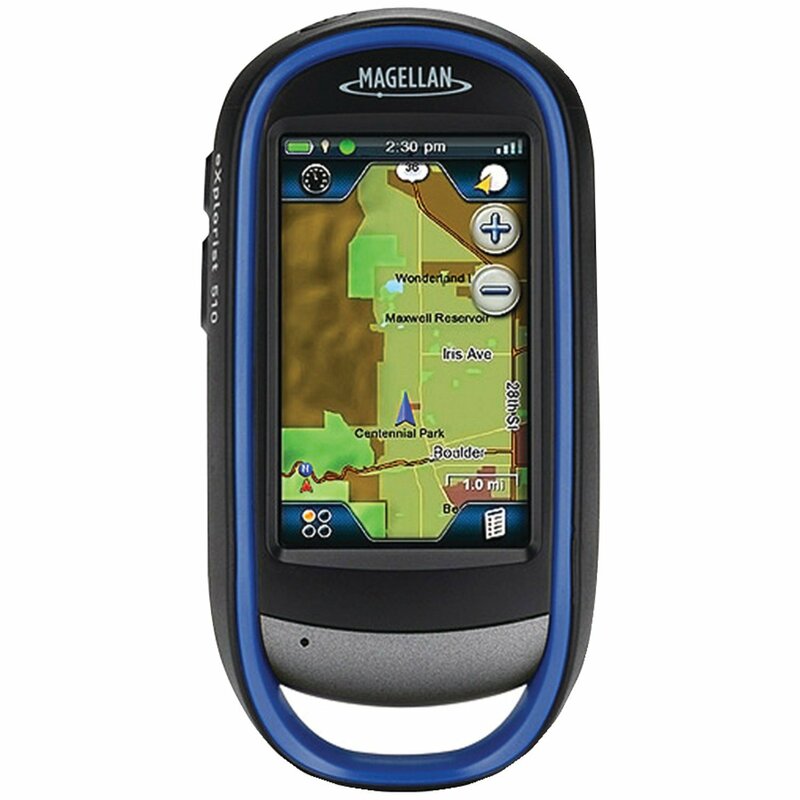 The eXplorist by Magellan, another famous GPS company is also waterproof. 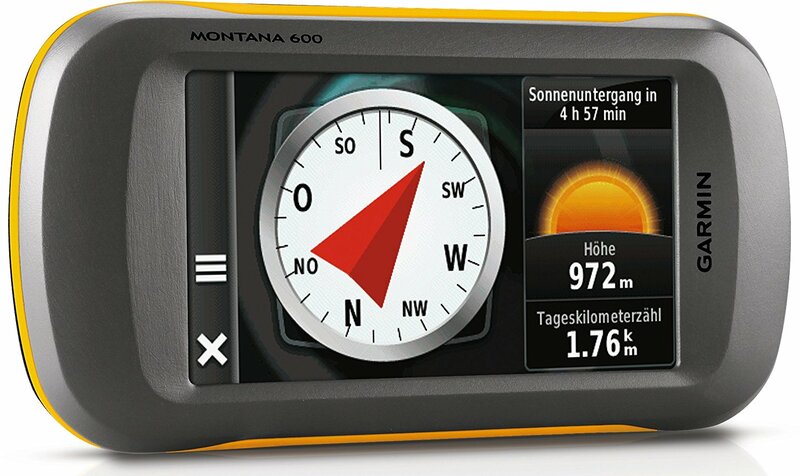 This GPS is smaller than the Montana, but has many of the same features. This GPS does come in three packages, as seen on its purchase page. If you will strictly use it while kayaking, you may want the Marine Bundle. 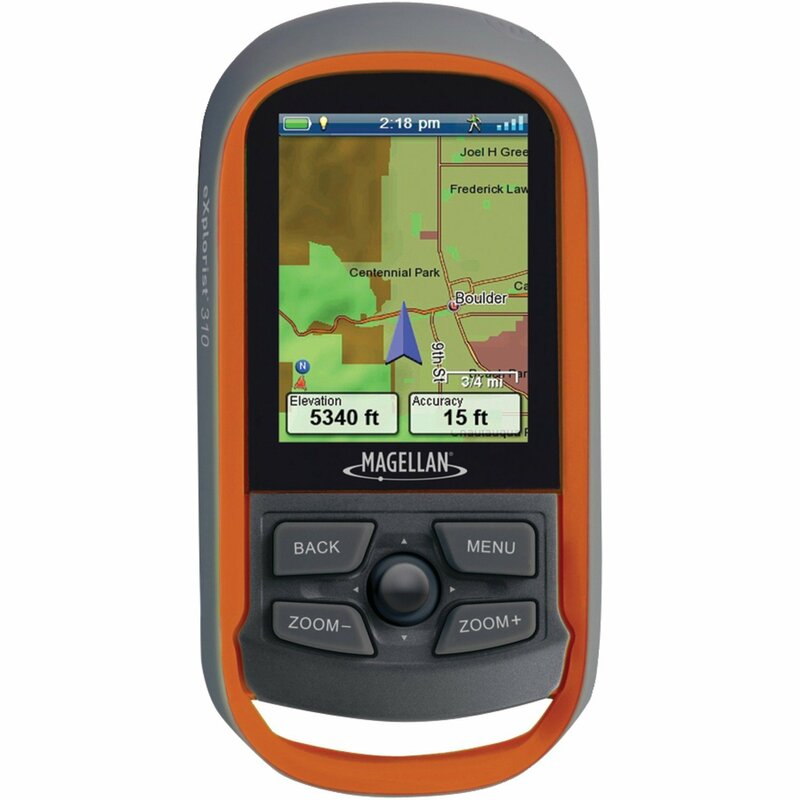 If you plan on using it for a blend of kayaking and hiking, you will probably want to purchase the Hiking GPS. If you purchase the Marine bundle, the GPS has maps of the topography of 12,000 lakes in the United States. This means you can see the depth of the lake while you are on it. This is a phenomenal feature for any kayaker. To start with, it has a screen which has day and night feature. This means that you can select the nighttime view for easier visuals at night. You can choose the daytime view so that you can see the screen in the daylight. It also has a 3.2 megapixel camera. This camera is not as high quality as the Montana, but you can take video with it as well as pictures. The GPS also has a built in microphone so you can record audio while taking the videos. Like the Montana, the pictures will be geotagged. A major perk with this gadget is its view capabilities. You can view the map in 2D or 3D, allowing you to be absolutely sure of where you are. This provides an extra measure of safety. Like the Montana, the eXplorist will hold its battery life for up to 16 hours. However, it only uses two AA batteries, instead of three. It does not have the option for rechargeable batteries. Another little excellent feature on this GPS is that it has two hard buttons. If you are fishing or have dirty/wet hands, instead of touching the screen and causing a mess you can simply preset the hard buttons for your favorite features and click them on the side of the GPS for quick access. One negative for this gizmo is that it is “waterproof”, as long as it is not under more than three feet of water for more than 30 minutes. This can be a little tricky to manage in a kayak, so you may want to store it in a dry bag and keep it on your person in case of tipping. It is also prime for geocaching. It connects with the geocaching website, allowing you to change targets as you kayak. 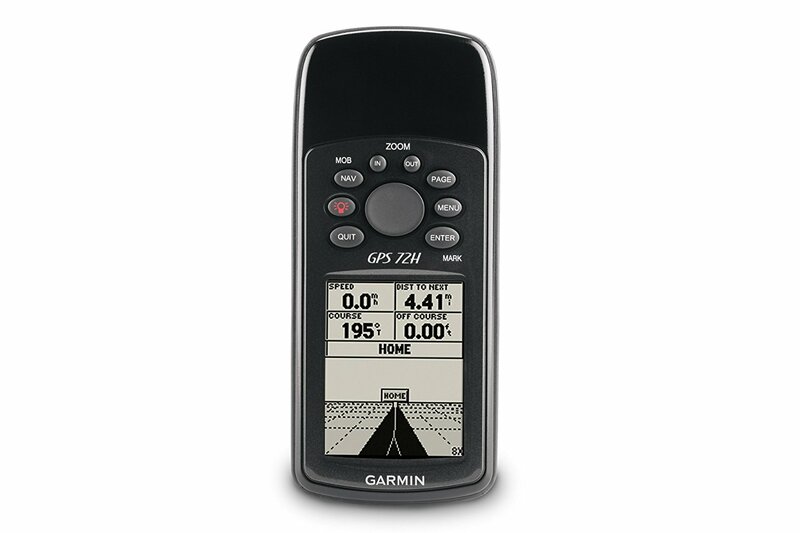 The 64st by Garmin is much smaller than the other GPS models on this list. In fact, it kind of looks like a miniature walkie talkie. However, this little model has very different features from the other GPS on this list. First, it has a daytime screen, which allows you to view it clearly in the sunlight. You can view maps easily to verify where you are. You can also sync this device with your smartphone so that you can read your texts and emails without ever taking out your smartphone. This is an excellent feature, as you can easily drop your smartphone in the water and most of them are not waterproof. Speaking of waterproof, the 64st is not a waterproof GPS. This is a negative when it comes to kayaking, but it would be very easy to keep it in a dry bag and pull it out only when needed. It would also be very easy to store in a waterproof compartment on the kayak. 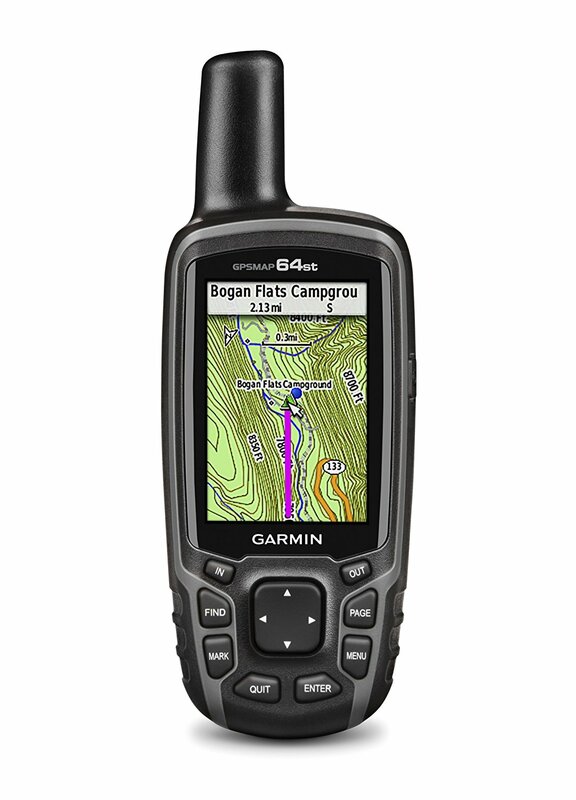 You can purchase a different model of this GPS which is waterproof. If you do this, you will forgo the bluetooth option of connecting to your smartphone. For battery life, this GPS can last 16 hours. It runs on either 2 AA batteries or on rechargeable batteries. Like many of the other GPS models, it has an altimeter a compass and an accelerometer. An accelerometer measures how quickly you are accelerating or moving. This is great for kayakers who hope to work on their speed, as you can literally use this as a tracker for yourself. Finally, like many of the other models on this list, it comes with a connection to geocaching.com. However, instead of directing you to the app or website, this model is preloaded with those 250,000 of the caches on the site. This can make your kayaking or hiking experience fun for the whole family–and it can make for a very spur of the moment experience. The eXplorist 310 is a completely different monster from the 510. You would think they would be much more similar, but the 310 comes in much smaller and with some excellent benefits. First, we have a 2.2 inch display with a sunlight friendly screen. This means you can see easily in the daylight, but it is a teeny tiny screen. This may be a major issue for some, but for others it may not matter. This device is also waterproof. It can withstand water of a depth of 1 meter, or 3 feet, for up to 30 minutes. It can also handle water splashing. For mapping, this device has preloaded maps of the entire globe, much like the others on this list. It also can download geocaches, but does not have them preloaded. This GPS has an advancement compared to the others on the list. The battery life is extended to 18 hours and runs off of 2 AA batteries. This allows for an even longer day out on the lake. Additionally, the eXplorist 310 has a suspend mode. This mode allows you to continue using the GPS feature on the device, but turns everything else off. The battery lasts even longer thanks to this mode. Finally, it can track your journey. It can monitor the number of steps you take and the waypoints you have made. In other words, if you stop it will register where you stopped. This is a great feature if you want to be able to repeat journeys or let someone else repeat your path. Can track your journey, steps, waypoints, etc. The 72H is much more basic than the other models on this list. It does not have as many features as the others, but it still serves its purpose as an effective kayaking GPS. First, it has a 2 inch display which is smaller than all of the other devices on the list. This device is not a colored display, but is just grayscale. It is viewable in sunlight. It also has a backlight, which means that it can light up to be visible at night. This backlight is not able to be turned off, however, which can be frustrating to some. For safety features, this device can withstand a depth of 1 meter for up to 30 minutes. This means that it is just as waterproof as the other devices on this list. However, the 72H also floats. If you drop your GPS out of your kayak, you are almost guaranteed the device will be safe because of this small feature. The battery compartment does have a tendency to get water leakage occasionally, it may be best to keep it in a dry bag. The 72H comes with a wrist strap to help prevent the GPS being dropped. It can also track your location, even in difficult weather. The battery can last up to 18 hours, just like the eXplorist 310. It uses AA batteries and does not have a rechargeable option. Finally, this device can track the trails or paths you have taken. This can ensure that you can find the route you have taken previously or that a family member can follow your same route. 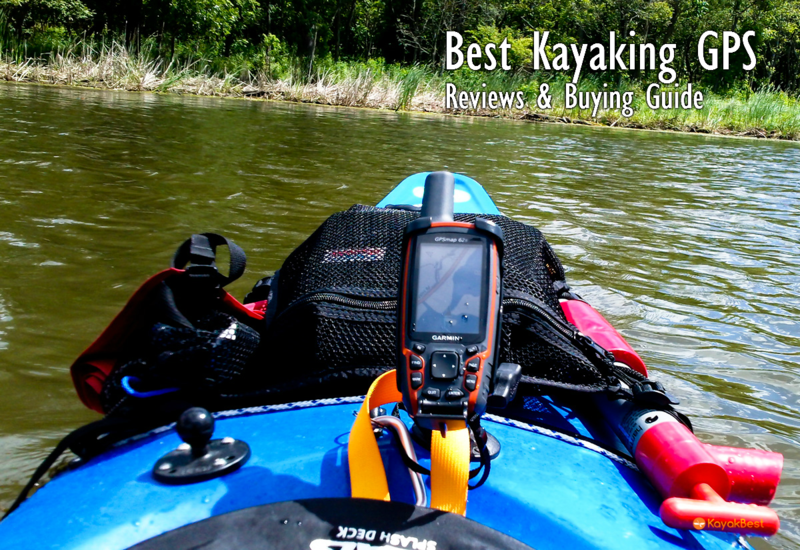 When purchasing a kayaking GPS, you must be sure it has all the features you need. 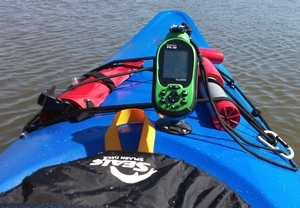 For most kayakers, a GPS must be waterproof. You want to ensure it has the tracking features you want as well. Perhaps you want your device to measure your distance or your speed or document the path you took on the water. All of these features can be crucial for various people, make a wise choice for yourself. What About Using a Phone? Most phones have GPS included, and it can be easy to choose to use your phone instead of a traditional GPS. That being said, there are several reason you should use a GPS. The GPS can track your journey better than a phone can. Additionally, the phone can fall prey to losing signal. If using your phone for a GPS when suddenly a storm rolls through, you can lose signal. If you are trying to find a geocache as you travel down the river with your family and you get too far from the nearest tower, you are suddenly lost. The GPS devices simply do not have this struggle and can keep track of your journey easily. Waterproof devices are simply hard to come by. Most GPS devices which are waterproof really only can withstand 1 meter, or 3 feet, of water for up to 30 minutes. If you are out kayaking and you drop your device in the water, it is very likely it will sink to more than 3 feet of depth. For the battery life of most GPS devices, they will last between 16 and 18 hours. This is a great life length, as it allows you an entire day out on the water. If the GPS has a mode, such as the suspend mode, which can save your battery, you will be able to use it even longer. However, one of the features to consider is the battery charge. Some devices come with AA batteries. Some come with rechargeable batteries. Some come with both. If you purchase a device with rechargeable batteries, you will not be able to recharge the device when you are out on the water. On the other hand, if your device takes AA batteries you can replace the batteries while you are kayaking. Kayaking is a very fun experience for individuals and for the whole family. However, it is easy to become disoriented when you are out on the water, especially if you are on a large body of water. It is very important to equip yourself with safety tools, including a GPS device. Choosing a GPS device can be a simple decision. If you would like a basic model, the 72H is an excellent option. If you want all of the bells and whistles, consider another device on this list. Each of these devices have their benefits, but they all have decent battery lifes, some water resistance, and unique features. Want to read about more kayak accessories? Check out our dedicated accessory section!